In one week, Raquel Marti, M.A. ’99, went from helping Hurricane Irma refugees flowing into Puerto Rico from other Caribbean islands to becoming a refugee herself when she had to flee Puerto Rico as a result of Hurricane Maria. Marti admits that she’s one of the lucky ones, though. 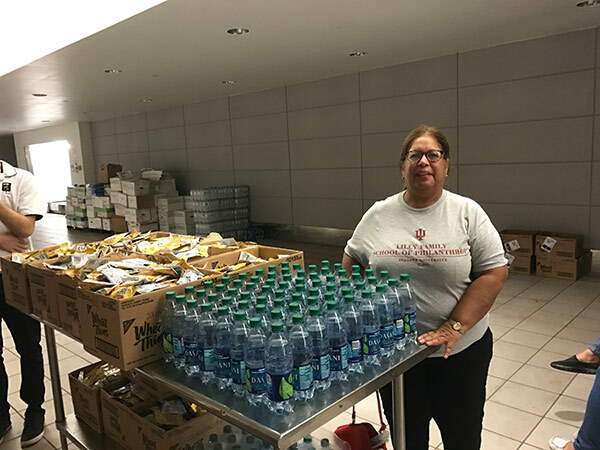 Being off the island has not stopped Marti from using her connections made through her work at the University of Puerto Rico and the Governor’s Office of Federal Affairs, as well as contacts with the Lilly Family School of Philanthropy and others on the mainland to spread the news about the disaster and explain the best ways to give back. Marti worries daily about people on the island, especially children. However, Marti regularly continues to raise awareness among people on the mainland. “Philanthropy is a big part of my life,” she said. “If I can help someone, I will. I never want to get through to a point where I sit down and cry. Instead, I stay active on social media in order to show how philanthropy can make a difference in general and how it’s desperately needed in Puerto Rico now.